IDS-509F2-C2SD40 Industrial Managed Switch. 9 ports: 7 x 10/100/1000Base-T Base-T RJ-45 ports and 2 x 100Base-LX, 1310nm single mode port with duplex SC connector [40 km/ 24.9 miles]. -10 to 60C operating temperature. PRO software feature set. The IDS-509 is designed to stand up to extreme temperatures, surges, vibrations, and shocks found in industrial automation, government, military, oil and gas, mining and outdoor applications. This 9 port Compact DIN Rail Switch supports a PRO feature that is ideal for enterprise-grade level environments where additional extensive security and network integration functionality is required such as AAA Security Services and Secure Management Sessions through SSH, SNMPv3 and HTTPS. 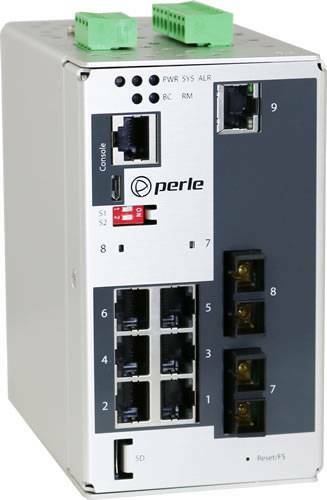 Perle's Fast Setup feature provides simple Plug and Play installation to get your Ethernet devices networked immediately. CCNA ( Cisco Certified Network Associate ) and CCNP ( Cisco Certified Network Professional ) trained engineers will appreciate the familiar Command Line Interface ( CLI ) via in-band Telnet or the out-band serial console port. For complete product details and technical specifications, please visit our IDS-509F Managed Industrial Ethernet Switch Product Page.